Hisense announced some new TVs back at CES in January, but we haven't heard a peep since then. Today, the H9 Plus Series 4K TVs are available for purchase. Why is this relevant? These TVs have Android TV and Assistant built-in. Most TV makers are still using their own proprietary smart TV interface, but Sony has embraced Android TV on some of its screens. Now, you can add Hisense to the list. The H9 Plus Series comes in either 55-inches or 65-inches. They support Dolby Vision HDR and HDR10, as well as local dimming, a 120Hz native refresh, and UHD upscaling. With Android TV, you have access to all the streaming media apps in the Play Store. Google says there are currently 3,000 apps optimized for TVs, plus you get Google Assistant built-in. There's also a special app pre-loaded to stream the 2018 World Cup. The 55-inch model retails for $699.99 and the 65-inch version is $1,199.99. The TV is already live at Best Buy, but it will eventually go on sale at Walmart and Hisense Direct, too. SUWANEE, Ga., June 12, 2018 /PRNewswire/ -- Global consumer technology leader Hisense today announced the availability of the H9E Plus ULED™ 4K Smart TV Series, featuring best-in-class picture quality, Android TV with Google Assistant built in, and an elegant bezel-less design. The Google Assistant allows Hisense users to ask questions, discover the best content and control smart devices around their home, all with just their voice. With the H9E Plus, consumers can use Google Assistant to control Hisense smart home appliances like the Hisense Portable Air Conditioners and Dehumidifiers. 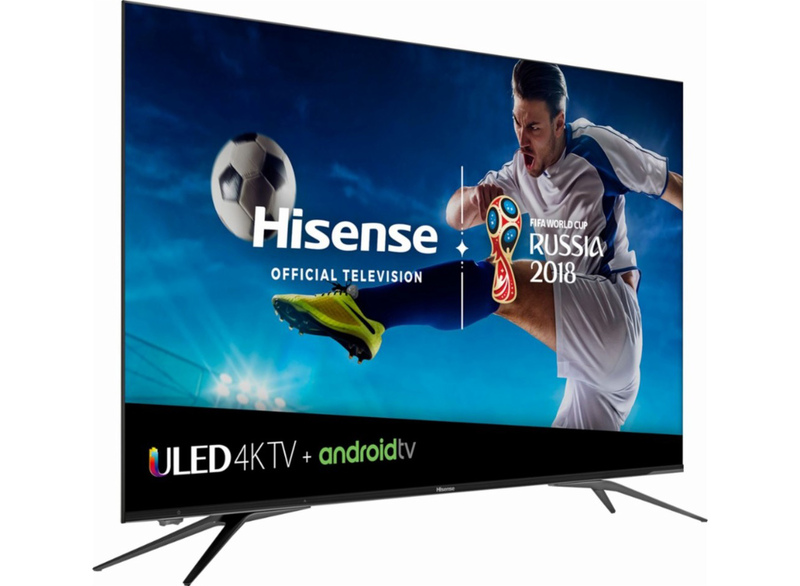 "We are thrilled to bring Android TV with Google Assistant to the premium H9E Plus," said Peter Erdman, Hisense USAVice President of Marketing and Business Development. "We recognize that consumers are looking for amazing picture quality, great content along with top-notch sound, all in an intuitive and customizable voice-controlled system." "Android TV re-imagines the living room entertainment experience by offering users a wide variety of content including Google Play Movies, YouTube and over 3,000 Google Play apps built for the big screen," said Shalini GovilPai, Director of Product Management, Android TV. "We're excited about working with partners like Hisense who match our level of excitement about building the future of TV experiences." First unveiled at January's Consumer Electronics Show in Las Vegas, the H9E Plus ULED™4K Smart TV Series includes proprietary ULED™ technology and premium features like Dolby Vision HDR*, HDR 10, Wide Color Gamut, Motion Rate 240, Local Dimming and room-filling natural sound by Harman/Kardon®. Awarded over 20 patents, Hisense's ULED™ technology offers better dynamic range and perception of black and white while enhancing color, contrast, black level, brightness and smooth motion. The H9E Plus also features the sleekest design of the Hisense product line, sporting a sleek, bezel-less edge. The H9E Plus also offers Android TV with Google Assistant. Android TV organizes and simplifies users' favorite content into one easy-to-view and easy-to-search experience. They can easily find their favorite shows and movies from 3,000+ apps through the Google Play Store. And, with the Google Assistant built in, they can easily control or search for media with just their voice. Available for purchase at www.Hisense-Direct.com, Wal-Mart and Best Buy. Check with retailers for current pricing.